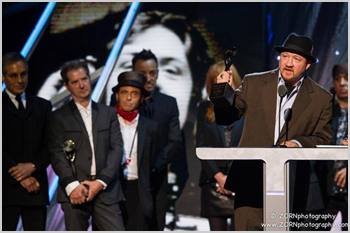 On April 10, 2014, ten current and former members of the E Street Band were inducted into the Rock and Roll Hall of Fame. Melanoma Research Alliance Board Member Jason Federici accepted the honor in his late father's memory at the 29th Annual Rock and Roll Hall of Fame Induction Ceremony at Barclays Center in New York City. In a moving speech, Jason remembered Danny's passion for music with the words, "He put his soul into the notes he played. He created a feeling: and he made it look easy." Congratulations to the Federici Family, and indeed to all the E Street Band members and their families, on this achievement.